For artificial basins to trap sediment, see Sediment basin. A structural basin is a large-scale structural formation of rock strata formed by tectonic warping of previously flat-lying strata. Structural basins are geological depressions, and are the inverse of domes. Some elongated structural basins are also known as synclines. Structural basins may also be sedimentary basins, which are aggregations of sediment that filled up a depression or accumulated in an area; however, many structural basins were formed by tectonic events long after the sedimentary layers were deposited. 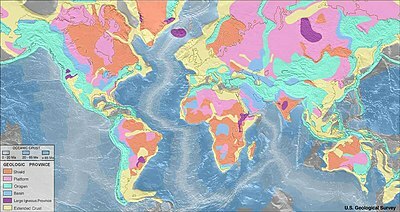 Basins may appear on a geologic map as roughly circular or elliptical, with concentric layers. Because the strata dip toward the center, the exposed strata in a basin are progressively younger from the outside in, with the youngest rocks in the center. Basins are often large in areal extent, often hundreds of kilometers across. Structural basins are often important sources of coal, petroleum, and groundwater.